The largest land-use changes are currently taking place in the tropics. Plate 7.1 shows a typical example of forest clearance in Peru. An estimated 13.7 X 106ha of tropical forests are expected to be cleared annually between 2008 and 2012, while only 2.6 X 106ha of cleared land in the tropics are annually afforested (IPCC, 2000). In the Brazilian Amazon region alone, deforestation during the past two decades has been estimated to be 1 to 4 X 106ha annually, with 70 per cent of this area being converted to pasture (Serrao, 1992; Melillo et al, 2001). Tropical forest soils are thought to be the largest single natural source of N2O to the atmosphere (Stehfest and Bouwman, 2006). Therefore, it is important to know the effect of land-use change on these emissions. In this section we look at the N cycle and N2O emissions in pristine tropical forests, at what happens during forest conversion and at the different outcomes depending on the type of land use succeeding the primary forest. 2003). Concentrations of NO3- were low relative to those of NH4+ in forest on 300- and 2100-year-old substrate, suggesting a strong competition between plants and microorganisms for NH4+ and little nitrification at these stages in a succession. Accordingly, N2O fluxes were negligible (< 0.01kg N2O-N ha-1 yr-1). However, in forests on substrates 20,000 years old, exchangeable NO3-increased and remained high in all older forests. Also, net nitrification rates had increased substantially up to 20,000 years. At the older sites, nearly 100 per cent of mineralized N was converted to NO3-. Consequently, fluxes of N2O increased up to 1.1kg N2O-N ha-1 yr-1 (Hedin et al, 2003). This is close to the mean of 77 observations (0.85kg N2O-N ha-1 yr-1) summarized by Stehfest and Bouwman (2006). Much larger values have been reported for individual sites, ranging up to annual fluxes of 6-7kg N2O-N ha-1 yr-1 in the undisturbed Tapajos National Forest, near Santarem, Brazil (Keller et al, 2005). Vegetation in a tropical rainforest has been found to take up three times as much mineral N as is taken up by microbes. Even so, 0.7 per cent of mineral N derived from organic matter decomposition was emitted in the form of N2O (Templer et al, 2008). Forest clearance initially reduces the uptake of mineral N by vegetation. Consequently, availability of mineral N to the microbial population may drastically increase and so may N2O emissions. Indeed, Melillo et al (2001), in western Amazonia, found pasture emissions to be 2.5 times those from the forest soils for the first two years, but decreasing to below the forest rate in pastures three or more years old. A similar observation was made by Neill et al (2005) in Rhondonia, Brazil, where annual emissions from forests were 1.7-4.3kg N2O-N ha-1 yr-1, whereas young pastures (one to three years) emitted 3.1-5.1kg N2O-N ha-1 yr-1 and older pastures (> six years) between 0.1 and 0.4kg N2O-N ha-1 yr-1. Earlier, Keller et al (1993), in a very fertile region of Costa Rica, had found N2O emissions (driven by rapid N mineralization and denitrification in moist soils) very much greater than those from the Amazon (Figure 7.1), decreasing to below the forest emissions only after 18 years after conversion to pasture. Veldkamp et al (1999), in a follow-up study at the same sites, recorded fluxes only about one-third of those found earlier, but the work was done in relatively dry periods, thus possibly giving an underestimation of the long-term mean. Forest clearance and establishment of coffee gardens in Sumatra show a similar pattern (Verchot et al, 2006): initially increasing N2O emissions followed by a decrease, although not below forest emissions within the first ten years (Figure 7.1). 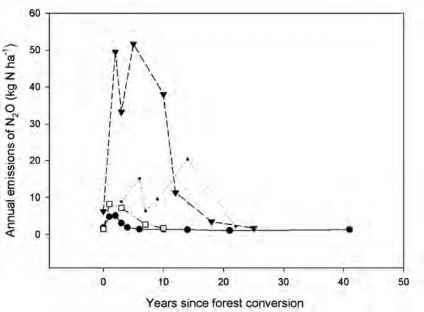 Also much shorter transient increases in N2O lasting only a few months have been seen following the slash-and-burn of secondary forest (Weitz et al, 1998). Some studies even report no such effect at all. In eastern Amazonia, Verchot et al (1999) recorded emissions from pastures only one-eighth to one-third of those from primary forest, similar to later observations by Wick et al (2005) in central Amazonia. gressive N limitation with pasture age to be probably caused by a combination of early loss of N through gaseous emission and leaching, reduced N fixation and the immobilization of N by grass litter and roots with a high C:N ratio. Consequently, rates of N mineralization and nitrification are smaller under pasture than under forest (Neill et al, 1999). Losses of N are further enhanced by the burning of biomass during forest clearance and on established pastures, which is a commonly used way to stimulate regrowth of fresh and palatable forage. Fire turns most of the organic N in the biomass into N2 but some NOx and N2O is also produced pyrogenically. Detailed measurements from tropical dry deciduous forests in India revealed that 0.05 per cent to 0.07 per cent of N can be released in this way in the form of N2O (Prasad et al, 2002). The overall effect of land-use change on regional N2O emissions is difficult to assess. A gradual decline in fertility as a consequence of reduced N availability leads to degradation of pastures and the described decrease in N2O emissions. An estimated 12 X 106ha of pastures in the Amazon region show some degree of degradation (do Carmo and Cerri, 2007). Modelling by Melillo et al (2001) indicates that the total contribution of the Amazon Basin to global N2O emissions has decreased slightly as a consequence of the land-use changes. Where grassland management is no longer economically viable, pastures are abandoned and secondary forest may establish. Such a development can reverse the situation regarding N limitation and N2O emissions (Davidson et al, 2007). Concentrations of N in litter increase with secondary forest establishment. Forests older than 20 years can already show signs of N abundance, as indicated by ratios of soil extractable NO3- to NH4+ greater than 1. Almost in parallel, annual emissions of N2O can grow from near 0.1kg N2O-N ha-1 to 1-2kg N2O-N ha-1 (Davidson et al, 2007). There are different ways by which forests are converted into agricultural land. Instead of slashing and burning the initial vegetation, it can be chopped and mulched. Davidson et al (2008) followed both systems during the first two years of establishment. They found that the chop-and-mulch system conserves plant nutrients and offers farmers new economic opportunities. However, it enhances N2O emissions by 50 per cent, although the overall greenhouse gas emissions in terms of CO2 equivalent over a 100-year timeframe are six times smaller than under slash-and-burn management, mainly because of reduced CH4 emissions from fire. Growing N-fixing trees, such as acacia, is another way to increase N cycling and raise productivity. Arai et al (2008) showed in a study on Sumatra, Indonesia, that in acacia plantations the ratio of NO3- to NH4+ was larger than in secondary forest, suggesting an easing of N shortage by the presence of acacia. At the same time, N2O emissions increased from 0.33kg N2O-N ha-1 yr-1 in the secondary forest to 2.56kg N2O-N ha-1 yr-1 in the acacia plantations. However, in terms of CO2 equivalent, N2O emissions from these plantations cancelled out less than 10 per cent of the CO2 uptake during the growth of these trees. Agricultural sustainability can also be increased by adding residues from N-fixing shrubs during the fallow period. 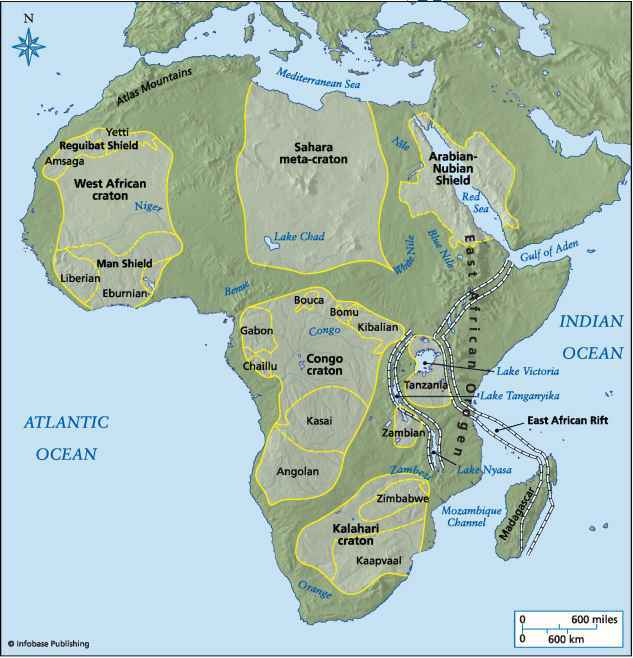 A study in western Kenya by Millar (2002, cited in Mutuo et al, 2005) has shown that this raises N2O emissions from 1kg N2O-N ha-1 yr-1 to between 1.4 and 4.9kg N2O-N ha-1 yr-1. Emission factors for residues from N-fixing shrubs were estimated to be between 0.5 per cent and 1.9 per cent, compared to an emission factor of only 0.2 per cent from the natural-fallow residues with probably a much higher C:N ratio. Other plantations commonly replacing tropical forest are rubber and oil palm, and these have been studied by Ishizuka et al (2005). They found that N2O emissions from such plantations in Jambi province, Indonesia, were spatially very heterogeneous but were of a similar magnitude to those from forests (0.76kg N2O-N ha-1 yr-1) and a factor of five larger than from grassland. Comparable emissions from rubber plantation and primary forest were also determined in Southwest China (Werner et al, 2006). Melling et al (2007) followed N2O emissions over one year on tropical peatland in Sarawak, Malaysia, where a mixed peat swamp forest emitted least N2O (0.7kg N2O-N ha-1 yr-1), followed by a palm oil plantation (1.2kg N2O-N ha-1 yr-1) and a sago (Metroxylon sagu) ecosystem (3.3kg N2O-N ha-1 yr-1). In warm humid tropics, such as Central Sulawesi, Indonesia, cacao agroforestry is a sustainable form of agriculture. However, N2O emissions (3.1kg N2O-N ha-1 yr-1) may be larger than from maize (0.8kg N2O-N ha-1 yr-1) or from secondary forest (2.2kg N2O-N ha-1 yr-1) (Veldkamp et al, 2008). Larger emissions of N2O per unit land area in more sustainable forms of land use are usually accompanied by a larger productivity (for example income generated per unit land area). Consequently, the emission of N2O per unit product may often be much lower than in less sustainable systems with smaller emissions but also a much lower productivity. To summarize, N2O emissions from tropical forests tend to be large compared to those from other natural ecosystems. Large NO3-/NH4+ ratios in soil indicate N abundance and high rates of nitrification and denitrification, both N2O-producing processes. Where forests are converted, emissions may transiently increase for a number of years. However, burning of vegetation and replacement with grassland, where C:N ratios in litter are much greater than in forest, often degrades the fertility of the ecosystem because of N limitation and N2O emissions decline below values previously observed under forest. Restoration, for example through N-fixing shrubs, restores previous rates of N cycling but also leads to larger N2O emissions. Rubber, oil palm, coffee or cacao plantations may be more profitable and sustainable than grassland. Yet they tend to have similar, sometimes larger, emissions than the forests they succeed.